I read about relationships all the time. Like, seriously, ALL the time. And a few months before our wedding I read that the whole “smash cake in each other’s face” was a sign of passive aggression. Some times I don’t even know what passive aggressive means, but I always know that I don’t want to be it or for it to exist in my relationship. There would be NO cake smashing. None. The thing is, I was marrying Mark and he likes crap like that. Smashing cakes and being silly. I think it has something to do with being a dude. This was probably my biggest Bridezilla moment during the entire wedding process. I demanded nothing short of pure happiness and bliss during the cake eating. I’m not really sure how looking like an old lady gremlin helped, but that face and neck elongation was how I planned to protect me and my dress. I guess. I’ll be honest, I can’t really remember if he ended up smashing cake in my face. I think he did a little bit. Nothing too horrible, I guess, considering I can’t recall it. My friend Veda had this on her Myspace page and I was SHOCKED. Um, Mark, you tried to kill me? While cutting our wedding cake? 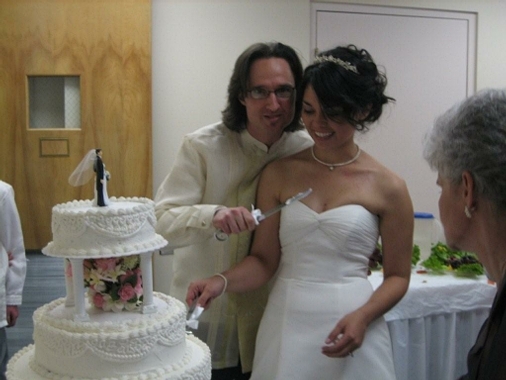 Here I am worried about a little cake on the dress and in reality I had just married Jack the Freakin’ Ripper. I told Stephen that I would not be a happy camper if he shoved cake in my face. There is nothing worse than starting a honeymoon with someone that’s not a happy camper! He behaved! I love that you are just seeing this photo. Awesome. We had no cake smashing, although people were calling for it! I told my husband that there would be absolutely no cake smashing at our wedding. It was inappropriate. It was childish. And I did not get up at 5 in the morning to have my makeup done only to have it wiped away by icing mid-reception. So B agrees, makes a promise that he most certainly will not smash cake in my face because he loves me and he knows that will upset me on our wedding day and our wedding day was to be about joy and happiness, not me crying. Awesome. So we get to the feeding of cake and I’m feeling loved and romantic. We each take a bite. And I lean forward to kiss my one true love, the wonderful man who did not smash cake in my face but lovingly placed a bit of cake in my mouth. What did he do? He licked my nose. His icing covered tongue licked my nose. We then had a collection of photos where I was trying to get the icing out of my nose and he was laughing hysterically. But, as my one true love likes to remind me, he did not smash cake in my face. LOL-I remember your face in the first pic! These pics are hilarious! Thanks for making my day. Well, it’s well known that at the actual event…I smashed cake on his face! Why? I have no idea. He got me back and cake fell down my dress. His reaction? He was going to retrieve it – much to my surprise! I should have made a rule about not fishing for cake down my dress! The whole thing just makes me smile! It worked out perfectly! Tom was the first one to bring it up before we got married. He said, “We’re not going to smash cake in each other’s face, right?” Easy enough. AND, that being said, at my aunt and uncle’s wedding, back when I was 5 years old, my uncle SMASHED, I mean SMAAA-AASHED, the cake her face. Apparently, my grandma was furious. And, for the record, their marriage was by no means a model one and they got a very long overdue divorce a couple of years ago. So, maybe there’s some truth to that not-Yahoo-Answers article!